An alternate title could be “what’s hanging (part three)”. This little marble shelf and bracket were installed today. Their purpose was to be a drop-off for my purse and sunglasses, but I’m now unsure about this. They’re just too precious to spoil with my scruffy everyday stuff. You can’t tell from this photo, but the marble top curves out in the front. In order to add depth—the antique bracket was too shallow to be useful as is—Charley McKenney, my architect, designed a way to push the bracket further out by mounting it to a thick wall-mounted board. Because the entrance to my bedroom is through that doorway on the right and the return vent is under the shelf, placing a piece of furniture larger than this shelf would not have worked. I’m thinking that this shelf needs a small sculpture. All in good time. 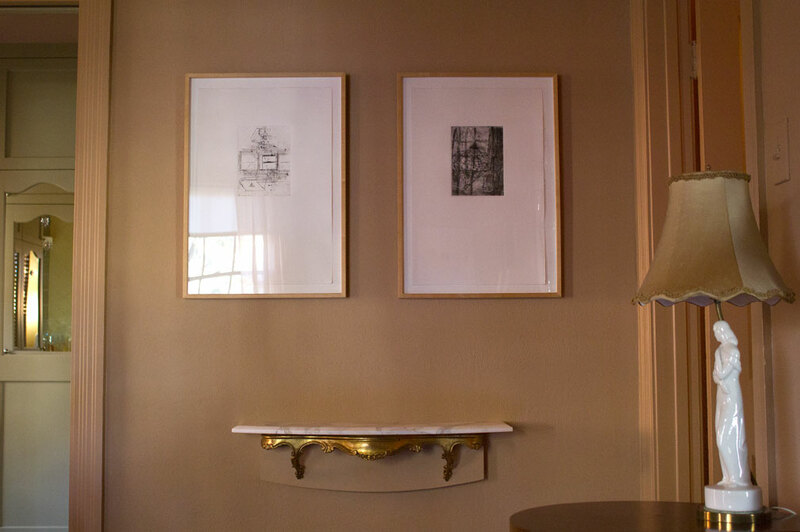 The two works of art above are by Lorraine Tady purchased through Barry Whistler Gallery back in 1995. They are both drypoint monotypes. The one on the left is Untitled, No. 117, and the one on the right is Untitled, No. 133. Hopefully someday I can get a better photo of these two. There’s just too much reflective glare during the afternoon, and the morning light would not have provided enough to show off this corner. I forgot to mention that the table lamp on the right is one of a pair that were once my maternal grandmother’s. I love their art deco vibe.